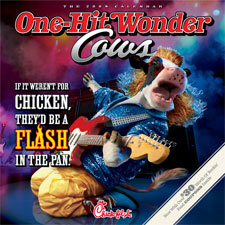 Chick-fil-a's 2008 Cow Calendar will feature "One-Hit Wonder Cows" in 2008. The calendars will cost $5 and will include more than $30 in Chick-fil-A food coupons. Chick-fil-A is also offering a free calendar to customers who purchase a re-loadable Chick-fil-A Card in the amount of $20 or more. In addition, four plush toy versions of the One-Hit Wonder Cows will be available for purchase at $4.99 each. Chick-fil-a has a video contest to celebrate their 40th anniversary. Starting tomorrow (November 13) Chick-fil-A is launching an online video contest to find the brand’s greatest fan in the country. Chick-fil-A fans can submit a video – up to one minute in length – "that creatively pleads their case as to why they believe they are the brand’s most passionate fan." The prize is 40 months of free Chick-fil-A Combo Meals, a trip for two to Atlanta to visit the corporate headquarters, and Chick-fil-A merchandise.